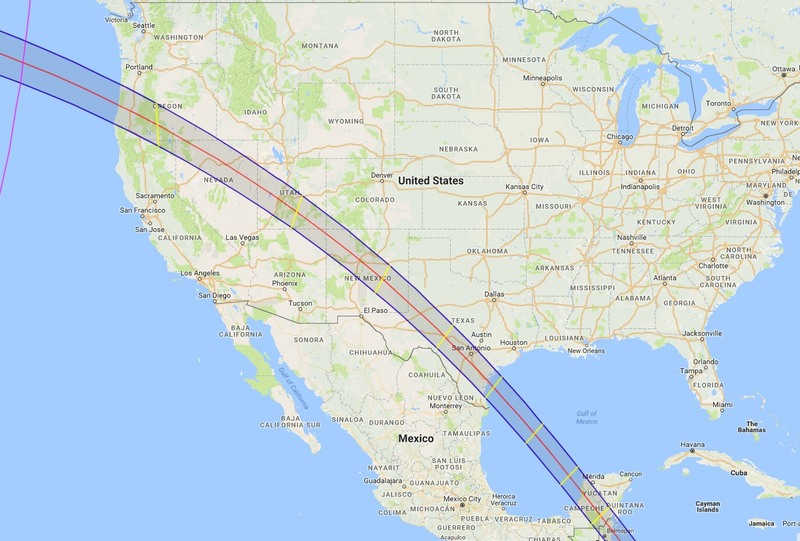 Yes,I am doing this thread well ahead a few years before the eclipse happens as I know many will want to travel to the totallity path knowing where it will be to make the plans for a trip with plenty of time. The city of Dallas,Texas will be the largest city in the totallity path. Times of eclipse from the start to when it ends below at code. Depending on the time zone,is Central Daylight time or Eastern Daylight Time. 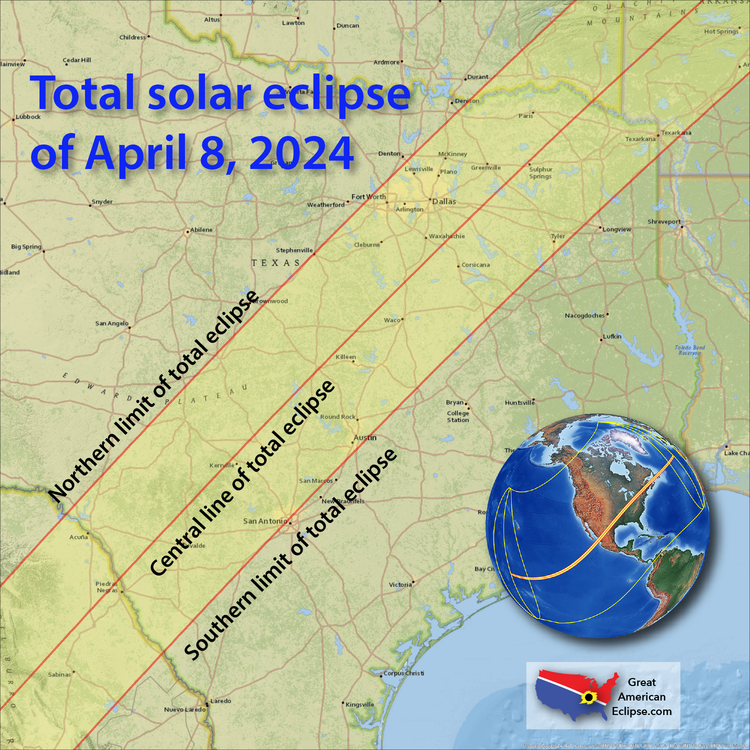 In the United States, totality will be visible through the states of Texas (including parts of San Antonio, Austin, and Fort Worth and all of Arlington, Dallas, Killeen, Temple, Texarkana, Tyler and Waco), Oklahoma, Arkansas (including Hot Springs, Jonesboro, and Little Rock), Missouri, Illinois, Kentucky, Indiana (including Bloomington, Evansville, Indianapolis, Muncie, Terre Haute, and Vincennes), a very small area of Michigan, Ohio (including Akron, Dayton, Lima, Roundhead, Toledo, Cleveland, Warren, Newton Falls and Austintown), Pennsylvania (including Erie), Upstate New York (including Buffalo, Rochester, Syracuse, the Adirondacks, Potsdam, and Plattsburgh), and northern Vermont (including Burlington), New Hampshire, and Maine, with the line of totality going almost directly over the state's highest point Mount Katahdin. The largest city entirely in the path will be Dallas, Texas. Closeup of path thru Texas. Closeup path thru the central states. Path thru the central,northern states. Path thru the Ohio/Lake Erie area that includes Cleveland. 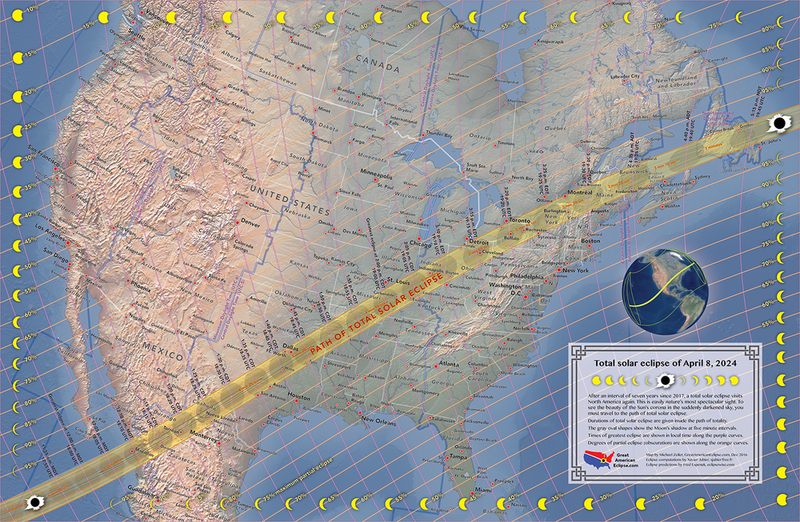 As a warm-up, there's an annular eclipse that cuts through the southwest U.S. and Texas on October 14, 2023. An annular eclipse occurs when the moon isn't quite large enough to completely cover the sun's disk, leaving a narrow ring of sun around the perimeter of the moon. In this case, 89.73% of the sun will be covered by the moon. I might drive to San Antonio to see this one. I saw the May 30, 1984 annular eclipse in south Louisiana when about 99.8% of the moon was covered. I couldn't make out a thin ring of sun around the edge of the moon. 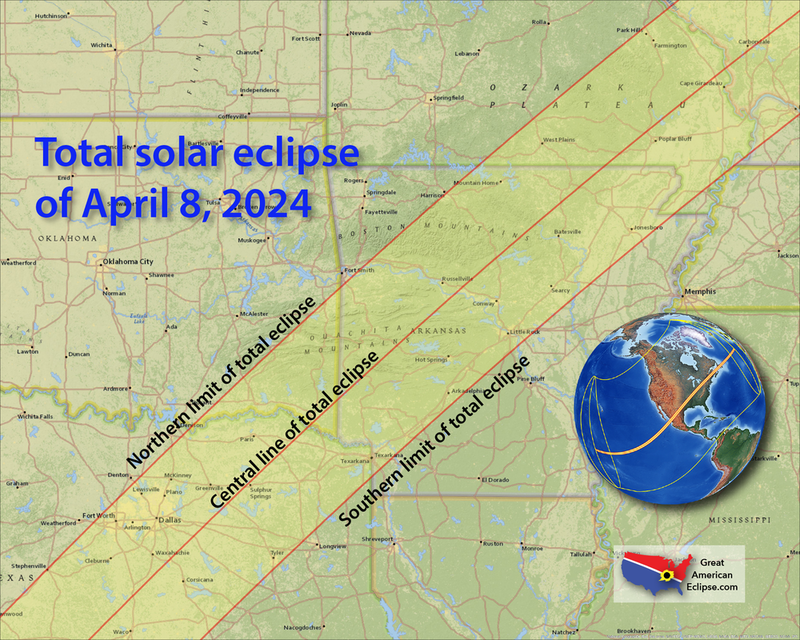 Thanks wxman57 for reminding us about the annular eclipse in 2023. 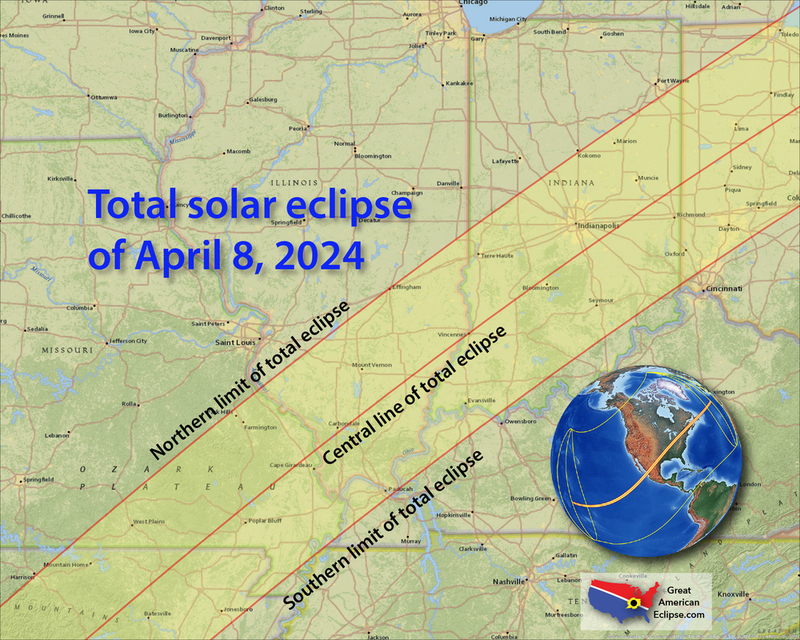 Also, thanks cycloneye for posting this info on the total solar eclipse in 2024. I definitely am planning a trip to Texas to see this event. It is never too early to plan for this type of event. It is completely worth the time and money invested to travel to witness a tremendous spectacle of a lifetime. The total eclipse last summer which I traveled to see in Columbia, SC was absolutely a thrill for yours truly!! Also, this particular total solar eclipse will be about twice in length of time duration of totality than the eclipse last summer in 2017. This total solar eclipse will last 4 minutes and 28 seconds in the center of the path. 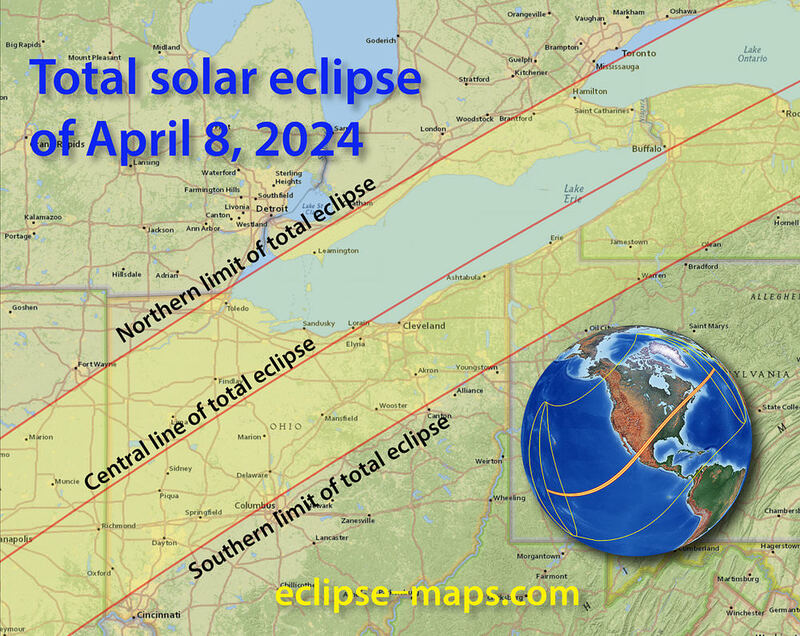 northjaxpro wrote: Thanks wxman57 for reminding us about the annular eclipse in 2023. That is why I decided to make this thread so early with plenty of time for those like you who are going to make the trip to the totallity path zone. Many details of the trip have to be done well in advance. Added to the first post the countdown ticker to the day and hour the Total Eclipse starts so it will be exciting to see how the days pass as it gets closer and closer to the big event. Interesting trivia about states that wont see a total eclipse on the rest of this century. 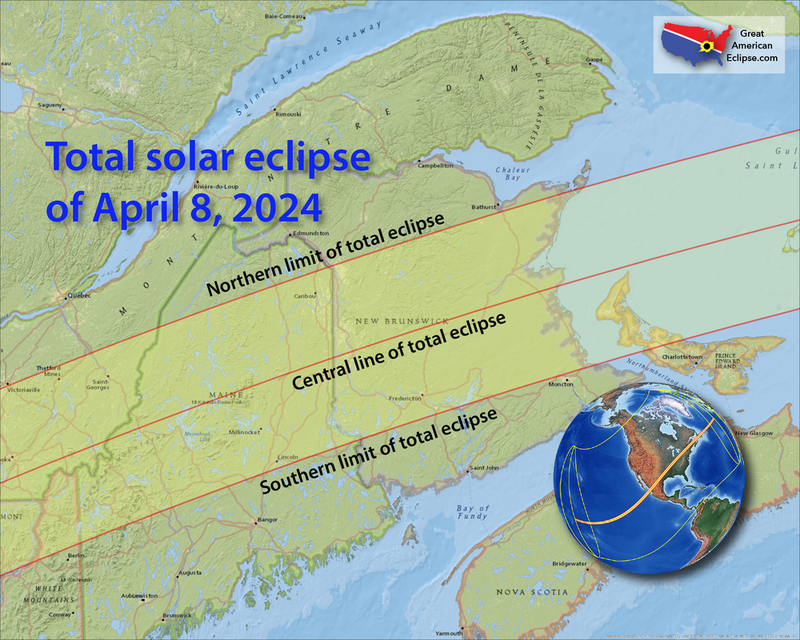 Good link to look at for those eclipse geeks that want to know about the next events after the April 8 2024 one. Thanks for those kind words about making this thread way ahead (1886 days left as of Febuary 7 2019) from the eclipse happening.Looking forward to your reports from the area that you will be. 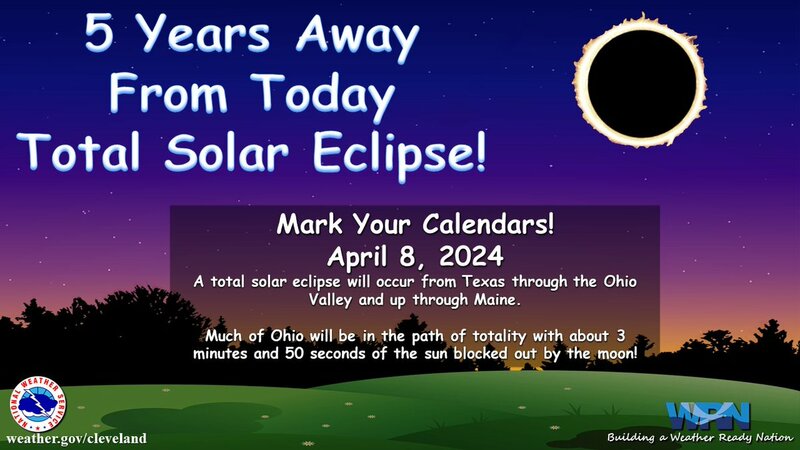 This is very interesting as you can look for your birthday date if it coincides with a Total Eclipse. Anyone celebrates their birthday on April 8? 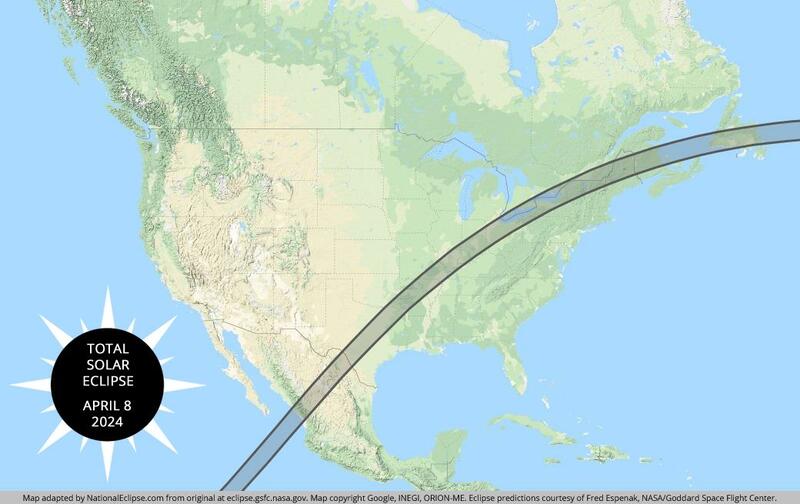 As of March 2 2019,there are 1,863 days left for the total eclipse. My birthday date is August 11. Dont miss this once in a lifetime eclipse.